Layouts are how Terminator helps you quickly start a given set of windows with the terminals arranged just how you like, and even launching unique commands in each one. It’s simple to create a new layout. Just launch new windows, add tabs and splits, arrange them, and customise them to your liking. 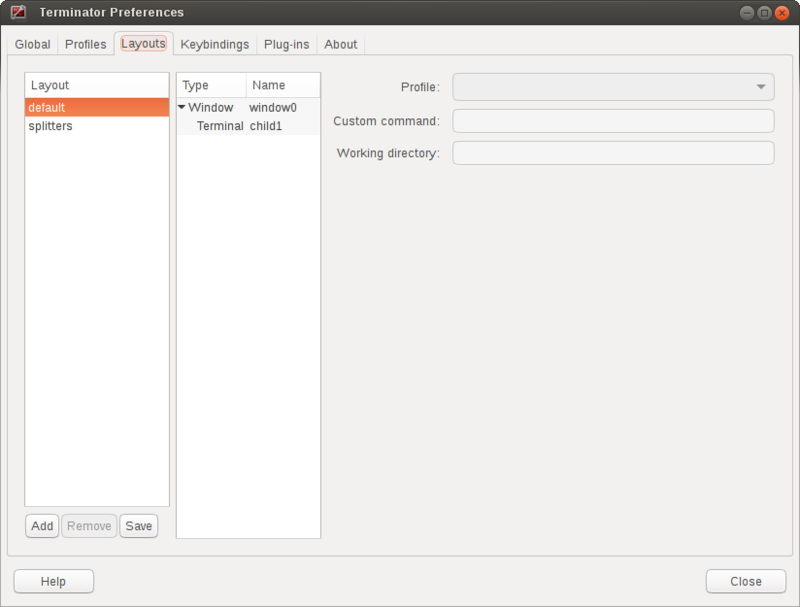 When done, use the Layouts section of the Preferences Window to keep this layout for future use. You save them by using the Add or Save buttons, where Add creates a new layout entry and prompts for a name, and Save updates the currently selected layout. Currently some things are not detected by the code, and have to be configured in the Layouts tab of the Preferences Window after the layout is saved/added. This means that if you use the Save button in the Layouts after spending time setting the items below, you will lose these stored values. First get the layout right, then edit these within the Layouts tab of the Preferences Window. You do not need to use the Save button to keep these settings. There is potential to improve this behaviour, as it is a little unintuitive. You can set up an application launcher with the -l LAYOUT option which will load the named layout, but what if you have a long list of layouts, like me? It can be annoying distinguishing between 30 items with the same icon, waiting for a tool-tip to tell you which one you’re about to launch. No-one has the stamina to draw 30 distinct icons representing all these layouts either! Enter the Layout Launcher, as shown on the right. This will list all of your saved layouts in alphabetical order, apart from default, which is always at the top. You can double-click an entry, highlight it and select Launch, or use the keyboard to move the highlight, pressing Return to launch. The Layout Launcher can be opened from a running terminal using a shortcut, or by running Terminator with the -s option. This option could be set in an application launcher, to get to the Layout Launcher with a single click. You can have more than one Layout Launcher window open, or you could launch one at the beginning, and pin it to always be on the visible workspace.